"Frances McDormand is aging. And unlike most people, she's perfectly fine with it. "We are on red alert when it comes to how we are perceiving ourselves as a species," the Oscar-winning actress, 57, told The New York Times in an interview this week. "There's no desire to be an adult. Adulthood is not a goal. It's not seen as a gift." "Something happened culturally: No one is supposed to age past 45 – sartorially, cosmetically, attitudinally," said McDormand, who is married to director Joel Coen. "Everybody dresses like a teenager. Everybody dyes their hair. Everybody is concerned about a smooth face." 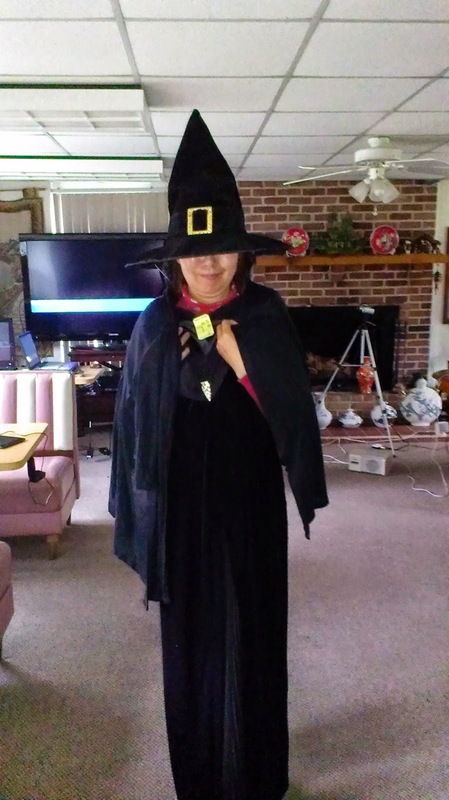 "I have not mutated myself in any way," she said. "Joel literally has to stop me physically from saying something to people – to friends who've had work. I'm so full of fear and rage about what they've done." In fact, she believes there is much to respect about the aging process. Looking older should signify "that you are someone who, beneath that white hair, has a card catalog of valuable information," she explained. That's one of the reasons McDormand is relishing her latest role as the aging Olive Kitteridge in HBO's mini-series adaptation of the same name, based on the Pulitizer Prize-winning book by Elizabeth Strout. The collection of short stories follows a married couple over the course of several decades as they face ordinary trials and tribulations. 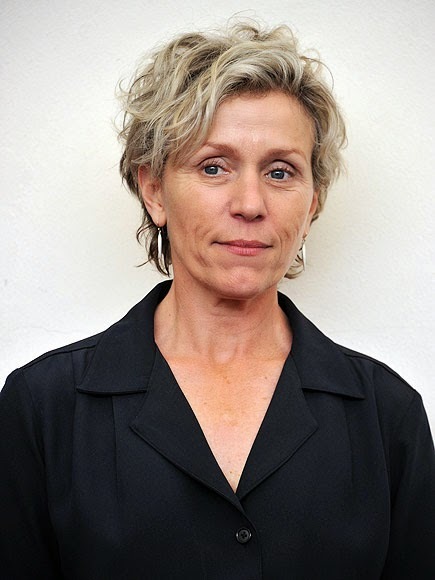 McDormand bought the rights to the book five years ago and helped assemble the creative team as one of the main producers. "It's a subversive act," she said of Olive Kitteridge, which will premiere Nov. 2." "One minute you’re living your normal life, the next, people start to get really sick and they can’t get any answers." 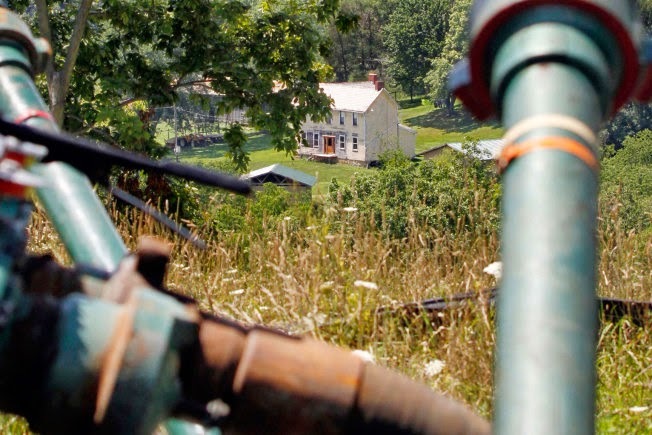 A Pennsylvania farmhouse sits below pipes and pumps used for hydraulic fracturing in 2011. For Carpenter's study, trained volunteers living near the wells conducted air measurements, taking 35 “grab air” samples during heavy industrial activity or when they felt symptoms such as dizziness, nausea or headaches. Another 41 “passive” tests – meaning samples were taken during a designated period, not merely when levels spiked – were conducted to monitor for formaldehyde. The tests were then sent to accredited labs. Not every sample exceeded the recommended limits. But in those that did – slightly less than half the samples taken – benzene levels were 35 to 770,000 times greater than normal concentrations, or up to 33 times the exposure a driver might get while fueling his or her car. Similarly, hydrogen sulfide levels above federal standards were 90 to 60,000 times higher than normal – enough to cause eye and respiratory irritation, fatigue, irritability, poor memory and dizziness after just one hour of exposure." Communities must wrest back local control. ...the possibility of an explosion is undeniable. Homeowners know that, unlike with oil-based fires that burn locally, an LNG fire could trigger an explosion that could race along the pipeline. "Homeowners and communities are unprepared for an invasion of their cherished private yards and public spaces. The Mid-Atlantic region is facing an expansion of natural gas transport infrastructure that threatens communities' health, safety and homes. With increased hydraulic fracturing (“fracking”) and plans to export liquefied natural gas (LNG), the gas industry needs supporting infrastructure. Beyond drilling wells, energy companies are building compressor stations and laying thousands of miles of pipelines. The Interstate Natural Gas Association of America has estimated that from 2011 to 2035, the industry must build nearly 15,000 miles of subsidiary lines — each year. 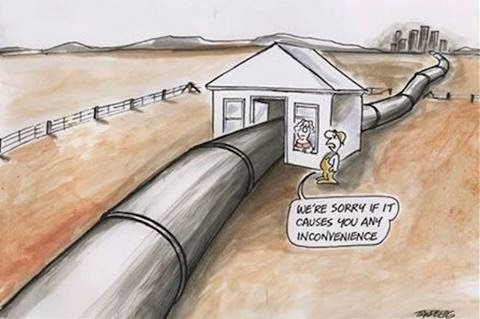 It is hard to ignore the compressors and pipelines extending quickly through the region. Last month, Dominion Power gained the approval of the Federal Energy Regulatory Commission for a plan to convert a dormant LNG import facility at Cove Point on the Chesapeake Bay into a major exporting facility for fracked gas. With the FERC's green light, Dominion will start exports from the facility in Lusby, Md., in 2017. Now, residents are engaged in battles to protect their families and neighborhoods: Until 2012, Lusby was a peaceful town of more than 20,000 people who happily raised children in a safe and quiet environment. Dominion's plans will turn their lives upside down, threatening quality of life, health, safety and property values. Families are distraught. About 360 homes lie within 4,500 feet of the site, to which large trucks will regularly haul heavy equipment and construction will generate noise. While an increase in pollution is undisputed, Dominion has easily satisfied the FERC's pollution-abatement requirement by buying clean-air credits from elsewhere in Maryland — which will not alleviate the toxic conditions around the facility." preservation of natural, scenic, historic, and esthetic values of the environment. including generations yet to come. for the benefit of all the people." The 50th anniversary season of Valley Players of Ligonier will begin with a performance of “Harvey,” the first show presented by the group in 1965. The story of an eccentric man who insists that he has an invisible 6-foot rabbit for a best friend, “Harvey” will begin at 7:30 p.m. Nov. 7. An opening night reception will follow. “It's a great honor to be directing the first show of the 50th-anniversary season,” said director Jennifer Appleby-West, who has been involved with the Valley Players for more than 30 years. 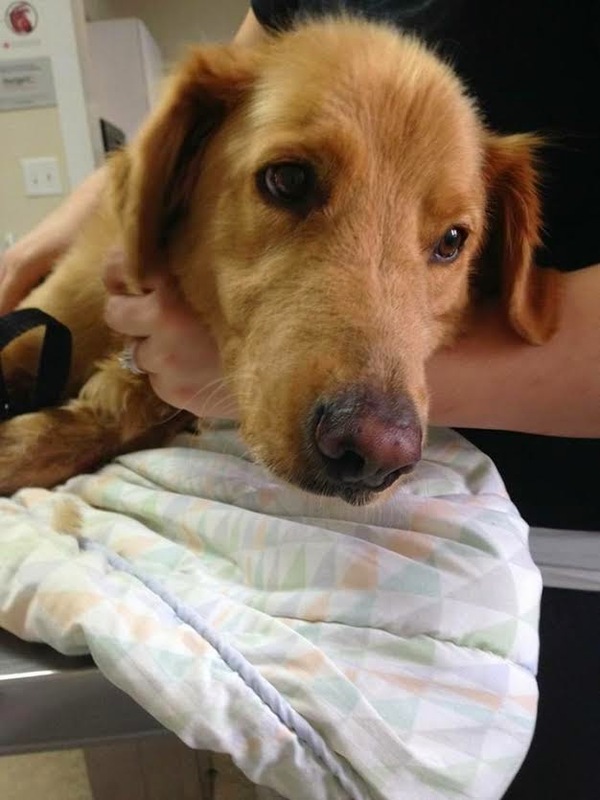 Ligonier police were notified of this Golden Retriever that was struck by a vehicle on Route 711 between Fort Palmer Estates and Murphy Road (north of the Sheetz). He is a young neutered male with a brown collar. If anyone has any information on this dog please contact Dr. Matson at 724-238-9645 or Amber Noel at 814-421-7078. The Lincoln Highway Heritage Corridor is “Thinkin’ Lincoln” during the month of November! 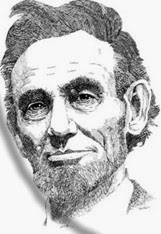 We will honor President Abraham Lincoln, the namesake of the Lincoln Highway, America’s first cross-country highway, through a presentation program, an “I Spy Lincoln” game, Twitter challenge, and new Lincoln collectibles and merchandise available for purchase in the Lincoln Highway Experience museum gift shop. On Sunday November 16, 2014, at 1:30 pm, Pittsburgh artist and Abraham Lincoln historian, Jack Puglisi, will visit the LHHC museum and present his, "A Brief Introduction to the Life of Abraham Lincoln." Puglisi, a member of the Associated Artists of Pittsburgh and the Pittsburgh Society of Artists, was recently featured at the Westmoreland Museum of American Art. Preregistration for this event is required on or before November 9 at a fee of $10 per person, which includes the lecture and refreshments. To register visit www.LHHC.org or call the Lincoln Highway Experience at 724-879-4241. The Lincoln Highway Experience museum is located at 3435 State Route 30 East, Latrobe, Pa 15650. The coffee grinder is gone! I am so bummed. Giant Eagle got rid of their coffee grinder! Though I enjoy Abigail's coffee during the work day, at home I like Eight O'Clock French Roast ground one notch above espresso. I really don't want to buy a coffee grinder for home. Will have to do my coffee shopping outside of Ligonier. Bummer! 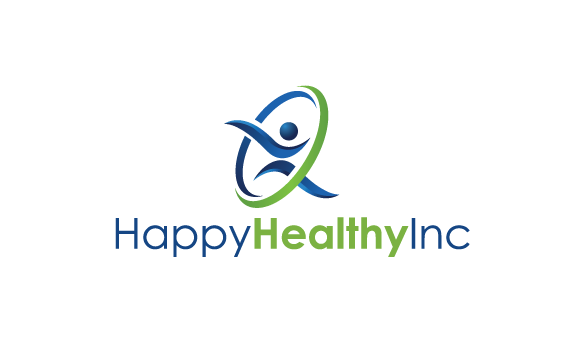 Happy Healthy Inc will be transmitting it's first On-Line Live Virtual Classroom session of Acupressure Point Treatment on Friday November 7 from 1:30 to 2:30. The initial session will address anxiety. Cost for the sessions are $10 for the first individual and $5 for each additional individual at the same location. Get a group together at your home or office and enjoy this innovative approach to teaching an ancient method of addressing a multitude of health problems. Further details and access to the CUMeeting software are available through www.happyhealthyclub.net. There is no need to register or sign in to access the "Classroom" tab. We hope to provide a beneficial instructional opportunity without the limitation of travel inconvenience. If you prefer, however, you can attend in person at Mountain Palace, 111 Creek Road, Bolivar, Pa. The Classroom provides video and audio real-time interaction with screen sharing, white board, video and file sharing for up to 22 people simultaneously. If you have Internet and a computer or Android phone or tablet or iPhone you can attend this session. Try something new! 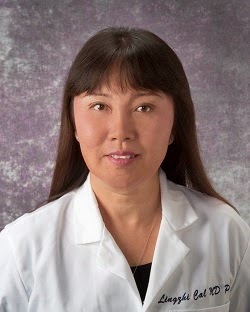 Presenter will be Lingzhi Cai, M.D., Ph.D.
A methane leakage rate above 3.2 percent may negate the fuel's climate benefits in the power plant, scientists say. And in such a case, gas will be as bad as coal. 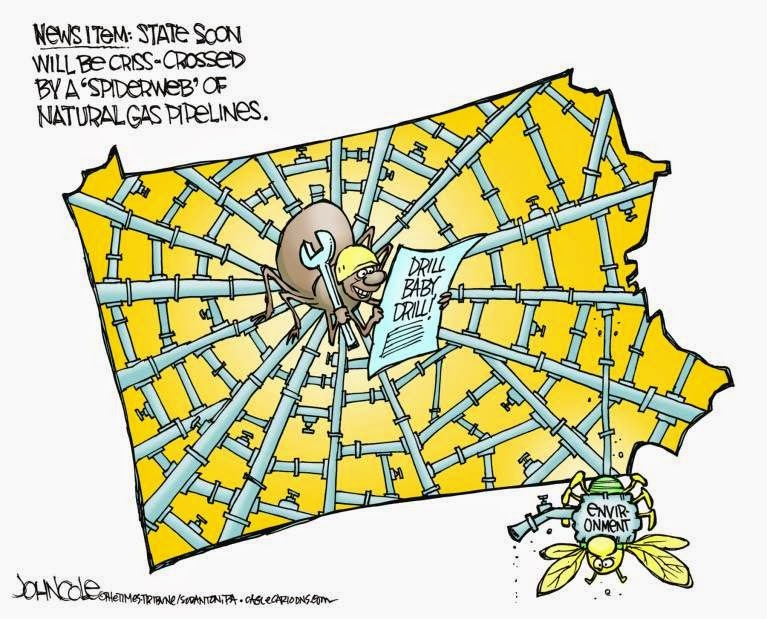 "Oil and gas basins in North Dakota and East Texas leaked around 10 percent of natural gas they produced to the atmosphere between 2006 and 2011. Natural gas is composed primarily of methane, a potent greenhouse gas that exacerbates climate change. Considering that North Dakota's Bakken Shale produced 485 million cubic feet per day of gas in September 2011, a 10 percent leak adds up to a whole lot of greenhouse gas emissions. The Eagle Ford of East Texas produced 1,232 million cubic feet of gas per day in 2011. The leakage rates were published this month in the journal Earth's Future. The leakage rate in the study is the largest reported so far for the energy industry, and it challenged the industry's and U.S. EPA's perception of operations as relatively clean. The study finds that the Bakken and Eagle Ford basins leaked between 3 percent and 17 percent of the natural gas produced between 2009 and 2011, with the Bakken most likely emitting 10.1 percent and the Eagle Ford most likely emitting 9.1 percent. For the study, scientists used satellite measurements and a unique methodology to compute the methane leakage rate, which is one of the key unknowns about energy usage in the United States today. The United States is in the middle of an oil and gas boom since 2005, and the Obama administration has promoted natural gas as a bridge fuel to a post-carbon future. The reasoning is that gas emits only half as much carbon dioxide as coal when burned in a power plant. But scientists have pointed out that gas may also be bad for the climate, not because of its carbon dioxide emissions but because of its methane emissions. The greenhouse gas is 86 times as potent as carbon dioxide for the climate on a 20-year time scale. The gas leaks from wellheads, valves, tanks, pipes, processing plants and other parts of the energy supply chain." 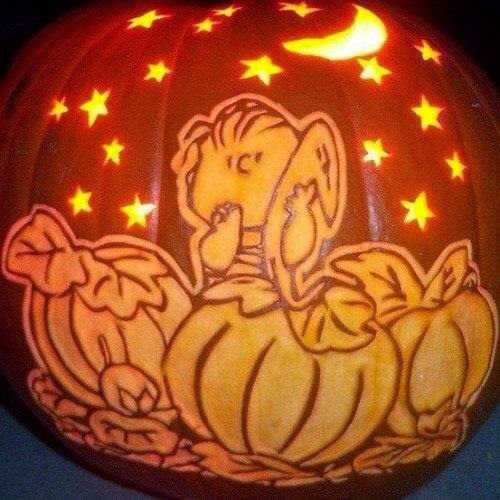 those hysterical hippies over at accounting giant Price Waterhouse...what worry warts! Overall, PricewaterhouseCoopers paints a bleak picture of a world that's rapidly running out of time; the required effort to curb global emissions will continue to grow each year. "With every year that passes, we're getting further away from averting a human-caused climate disaster. That's the key message in this year's "Low Carbon Economy Index," a report released by the accounting giant PricewaterhouseCoopers. 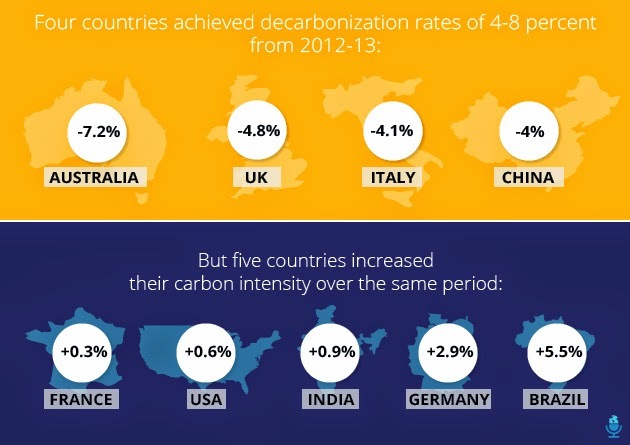 The report highlights an "unmistakable trend": The world's major economies are increasingly failing to do what's needed to to limit global warming to 3.6 degrees Fahrenheit above preindustrial levels. That was the target agreed to by countries attending the United Nations' 2009 climate summit; it represents an effort to avoid some of the most disastrous consequences of runaway warming, including food security threats, coastal inundation, extreme weather events, ecosystem shifts, and widespread species extinction. To curtail climate change, individual countries have made a variety of pledges to reduce their share of emissions, but taken together, those promises simply aren't enough. According to the PricewaterhouseCoopers report, "the gap between what we are doing and what we need to do has again grown, for the sixth year running." The report adds that at current rates, we're headed towards 7.2 degrees Fahrenheit of warming by the end of the century—twice the agreed upon rate. Here's a breakdown of the paper's major findings." Last year, Brent Grushecky, 58, of West Newton read a newspaper story about Canyon Heroes, a Ligonier group that sends veterans with physical and emotional issues on therapeutic rafting trips through the Grand Canyon. A year later, Grushecky, who served as a military policeman in Germany during the Vietnam War, can testify to the transformational quality of the program. In July, Canyon Heroes sponsored a weeklong white-water rafting journey down the Colorado River for 15 veterans. They served during various wars, but all have been diagnosed with post-traumatic stress disorder. Three counselors assisted the veterans through the recreational therapy. “It made me feel like, my God, there are things out here in this world that are worth living for,” Grushecky said. Will Panichelle have an upset win? The Republican challenger for Pennsylvania's 55th Legislative District is looking to run his campaign like his business. The owner of Ligonier-based BP Insurance Inc., Brian Panichelle, 40, of Latrobe said he built his company's clientele not with advertising, but face-to-face interaction and networking. Now, the Burrell High School graduate is employing the same strategy in his first run for political office against the incumbent state Rep. Joe Petrarca, D-Washington Township. 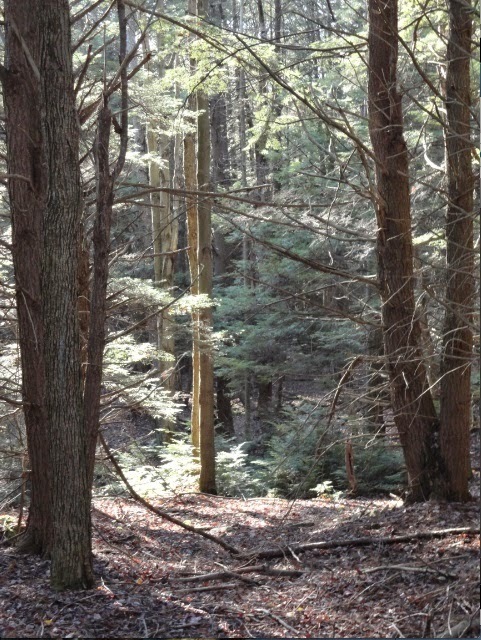 Plans to restore the ski facilities at Laurel Mountain State Park will go before the Ligonier Township supervisors for approval in November. Township manager Terry Carcella said Thursday that a decision on the proposed plans should not have been postponed at a planning commission meeting this week because the architect and engineer for the project were seeking only a modification to a previously approved plan. Stop by Graham's Grill at Ligonier Beach! Such amazing food, you must give it a try. 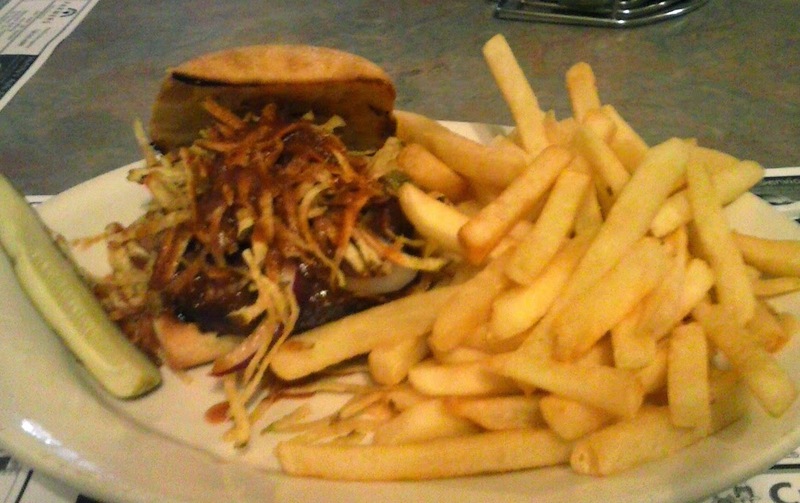 The Cuban Burger - 1/2lb burger topped with red onions, fresh crispy extra thin fries and our special zesty Cuban sauce on a fresh baked roll. The best homemade chicken noodle soup for all of those with the sniffles! "(A) team of researchers from Dartmouth College, Stanford University, and the French Geological Survey among others created a tool that they say can trace the “isotopic and geochemical fingerprints” of the fracking process. In simpler terms, the tracer picks up what the researchers say is a unique, chemical fingerprint left behind by the fracking fluid injection process. The tracers track two elements — boron and lithium — which occur naturally in shale formations. When fracking fluid is injected underground, those two elements are naturally released along with oil, and the fracking fluid then becomes enriched with the elements. When the fluid comes back to the surface, Vengosh said they have an isotopic fingerprint that is different than any other type of wastewater, including wastewater from conventional oil and gas operations. “Many of the fracking operations today are happening in areas that have a legacy of 20, 30 years of conventional oil and gas development,” Vengosh said. “So when there’s contamination, [fracking companies] can say ‘Oh, it’s not us — it’s the legacy of 30 years of operations here.”“We now have the tools to say, well, sometimes you’re right and sometimes you’re wrong,” he added. As fracking has boomed across the United States, so has the use of water to do it. A 2013 report from Environment America showed that fracking wells nationwide produced an estimated 280 billion gallons of wastewater in 2012 — a huge number considering more than 55 percent of fracked wells are in areas experiencing droughts. Vengosh was also part of a research team that found there are more risks of drinking water contamination from fracking wastewater than was previously believed. In a peer-reviewed paper released last month, he and other scientists from Duke and Stanford found that even when fracking wastewater goes through water treatment plants, and is disposed of in rivers that are not drinking water systems, the treated water still risks contaminating human drinking water." 'Since Breast Cancer Action first coined the term pinkwashing, there’s been no shortage of shocking examples. Car companies Fiat and Ford participated in pink-ribbon marketing in spite of the links between auto exhaust and an increased risk of the disease. KFC sold greasy, heart disease-causing “Buckets for the Cure” in the name of women’s health, just a few years after being sued for suspected carcinogens in its food. Even Komen’s own Promise Me perfume raised concerns for its chemical contents. All too often, Komen is receiving pinkwashed donations and providing cover to companies that are helping to fuel an epidemic. The partnership with fracking company Baker Hughes is among the worst examples of Komen’s pinkwashing so far. More than 700 chemicals are used in the process of drilling and fracking for oil and gas. In a study of about 350 of those chemicals, researchers found that up to half can cause health problems, including nervous, immune and cardiovascular symptoms. More than one-third can disrupt the hormone system. And a quarter of the chemicals, such as benzene and formaldehyde, increase the risk of cancer." Market on Market — an indoor farmer's market offering fresh foods throughout the winter — is the Horvath's new plan for their 114 N. Market Street building. They hope to open Nov. 1, operating 9 a.m. to 1 p.m. each Saturday. Fort Ligonier Days crafters and food booth vendors vied for more than just a fair share of the customer base at this years' three-day festival. A team of judges evaluated the booths and craft lots, looking for the best of the best. The food booths were judged in six categories. Boy Scout Troop 372 placed first in the best food value competition. Darlington Volunteer Fire Co. placed second and Rotary Club of Ligonier was awarded third place. The best booth appearance was awarded to Bethlen Communities. 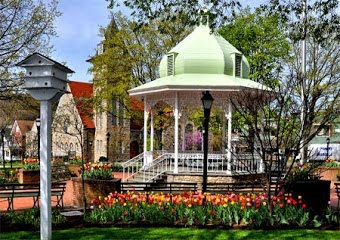 After the great success of the inaugural Ligonier Art Walk in May, local galleries are coming together once again for the Affordable Art Stroll — an event that promises to be an enjoyable, educational event for all. Participating art galleries and the Southern Alleghenies Museum of Art will simultaneously play host to the Affordable Art Stroll in Ligonier on Nov. 1. The event will begin at 10 a.m. to noon at SAMA with a marbling technique demonstration (reservations required) and will continue throughout the afternoon at six Ligonier art galleries: Allegory Gallery, Conte Design-Lifestyle Gallery, Dovecote Ligonier, G Squared Gallery, Jaime Cooper Gallery & Studio and Main Exhibit Gallery. We brought this bookcase to our new office and found that we don't need it. Stop by 610 West Main Street 9 to 5 or call 724-238-7783. Utility Truck & Flatbed Truck from Ligonier Township Municipal Authority, located in Ligonier, PA. Planes, Trains, and Automobiles: A Daytrip Through Transportation History, brings together the KLBE Air Museum, the Lincoln Highway Experience, and the Ligonier Valley Rail Road Museum on Saturday October 25, 2014 beginning at 10:00 a.m. Preregistration is required for this guided tour, but attendees need to provide their own transportation to each site. The first museum on the tour is the KLBE Air Museum at Arnold Palmer Regional Airport, which commemorates the history of air travel in Westmoreland County. Continue your journey up the Lincoln Highway to visit the Lincoln Highway Experience, which resides in a 200-year-old National Register listed building. The daytrip ends at the Ligonier Valley Rail Road Museum, housed in a fully-restored original railroad station built around 1896. . Preregistration is required; the fee of $12 per person includes admission to all three museums. To register call the Lincoln Highway Experience at 724-879-4241. "The Climate Marchers will be arriving late this afternoon (in Ligonier). They will be hosted by the Unitarian Universalist Fellowship of Ligonier Valley. We are having a potluck supper for them, followed by a discussion. Everyone is welcome! (If you come for the potluck, please consider bringing something to share, as there are 50+ marchers!) Most of the marchers will be staying at the Fellowship for the night... some hardy folks are still planning to sleep outside in their tents! (My guess is they'll change their minds!) After an early breakfast, the group will leave around 8 am, and continue their march toward Washington DC, where they plan to arrive Nov. 1. One (or more) of the marchers will stay behind and speak at the UUFLV Sunday service, which starts at 10:30 am." For more information about life on this amazing march from LosAngeles to DC, go to http://climatemarch.org/. Pittsburgh and Monroeville hosted these marchers earlier in the week: http://www.post-gazette.com/local/city/2014/10/14/Climate-change-activists-bring-Great-March-for-Climate-Action-to-Pittsburgh/stories/201410140163. 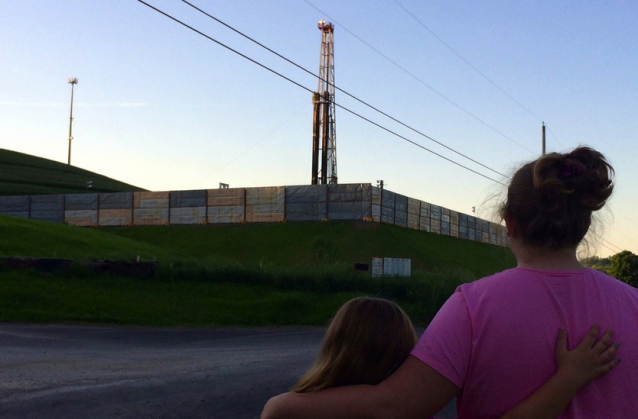 A Mars school district parent and child look at a drilling rig in Western Pennsylvania. A group of concerned Pennsylvania parents have launched a legal challenge against their town council’s recent decision to allow five horizontal gas wells about a half mile from the Mars School District, a campus of 3,200 children. The four parents, joined by the environmental groups Delaware Riverkeeper Network and Clean Air Council, contend that the Middlesex Township Board of Supervisors violated Pennsylvania’s state Constitution when it voted to change the township’s zoning laws back in August. Those changes legally opened up Middlesex’s residential and agricultural lands for potential drilling, despite the protests of parents and residents concerned about air pollution, water contamination, and noise. The zoning law change has wide implications for drilling and fracking in Middlesex, but the main reason for the change was to pave the way for the proposed gas wells near the school. The Geyer well site would be placed on farmland owned by Middlesex residents Bob and Kim Geyer, and operated by a company called Rex Energy. The wells would be about 3,000 feet from all of the school district’s buildings, a youth homeless center, and just 800 feet from a residential community where many of the schoolkids live. Jennifer Chomicki, a party to the lawsuit and a mother of two young daughters who will attend the Mars school district, told ThinkProgress about her concerns with the Geyer well site in August. “I definitely wouldn’t have moved here if I had known there would be a well pad 1,200 feet from our home,” she said at the time. Watch more of Chomicki’s comments to ThinkProgress below:"
Would you like a box of garment bags? Found this box of garment bags in the cupboard. We used them in the old Harmony's Attic store. 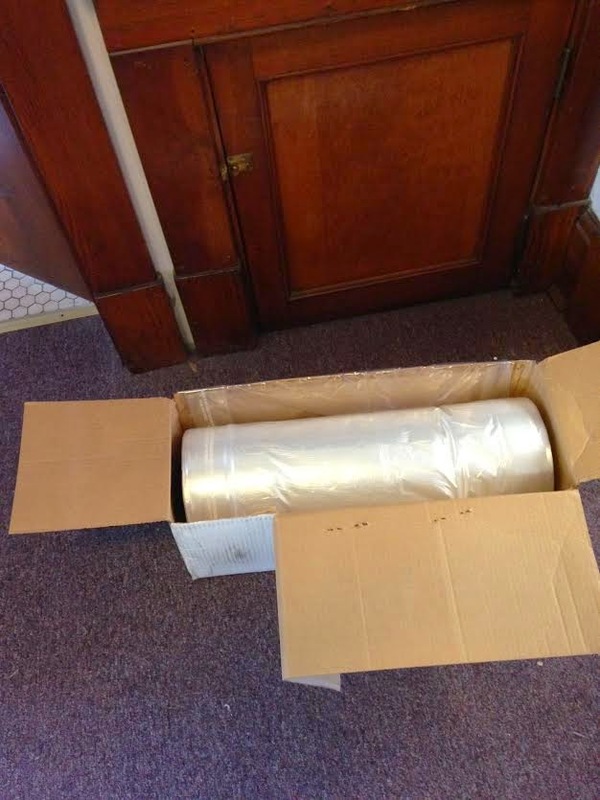 It's a big roll of dry cleaning style bags. I AM LEAVING THE BOX ON THE FRONT PORCH AT 204 WEST MAIN STREET. TAKE IT IF YOU WANT IT. Mountain Palace - Cumin Chicken Broccoli! The streets of Ligonier were quiet Monday, only the rustling sounds of the fallen leaves on the pavement could be heard. It was a well-deserved reprieve from the 55th Fort Ligonier Days festival that began three days earlier, bringing thousands into the Ligonier Valley for food, crafts, music and a taste of history. “There are so many people to thank for the many different ways they contribute to making Fort Ligonier Days a fall festival that we all can be very proud of,” Mowrey said. Ligonier Township voters will select two supervisors in the general election on Nov. 4. The Community Coffee House at The Barn, Springer Road in Ligonier opens for the season 7 p.m. Friday with a talented lineup of musicians new to the venue as well as some longtime audience favorites. Admission is $5 at the door. Coffee, tea and desserts are available for purchase. Appearing for the first time at Coffee House is Cathasaigh, an award-winning roots revival singer-songwriter. She has been voted eight times one of Pittsburgh's best. She accompanies her vocals with acoustic guitar and or digital piano. Ligonier Valley School District is looking into starting a mental health program at its high school. “With the increasing concerns with adolescent mental health, I think it's important to possibly address this through our adolescent youth at the high school,” Clark said. Raise a glass to Four Seasons! Congratulations to Christian Simmons and head brewer Mark Pavlik, co-owners of Four Seasons Brewing in Latrobe, for winning a silver medal for their "Dark Side of the Pint" oatmeal stout at the Great American Beer Festival in Denver! The Ebola story is interesting but keep it in perspective. “I urge individuals to try to keep this in perspective. It is scary, it is worrisome, but in our country, more people will die from the flu than from Ebola,” Montgomery Health Officer Ulder Tillman said earlier this week. Office space for rent includes 3 rooms on the 2nd floor, private bath, all utilities, and free parking. Located on Route 30 between Latrobe and Ligonier. Call 724-879-4241 for more information. Ligonier Township will look into the feasability of a regional police force. At the supervisors meeting Tuesday, the board voted unanimously to send a letter of intent to the state Department of Community and Economic Development for a regional police study, as well as an efficiency study of the township's public works. Manager Terry Carcella said the study will look at aspects of the township, such as population, patrol area, current coverage, costs and availability of grants to fund a regional force for a number of years. PA Constitution...are our elected officials upholding it? According to NOAA’s new publication, Explaining Extremes of 2013 from a Climate Perspective, there is no discernible connection between global warming and 2013 extreme weather events such as the California drought, Colorado floods, the UK’s exceptionally cold spring, a South Dakota blizzard, Central Europe floods, a northwestern Europe cyclone, and exceptional snowfall in Europe’s Pyrenees Mountains. The California drought provides a good example of global warming activists making false and irresponsible claims regarding global warming to deliberately mislead people who aren’t familiar with scientific studies and evidence. The liberal Center for American Progress and its media allies such as theWashington Post, San Jose Mercury News, Associated Press, and others have all published stories claiming global warming caused or worsened the ongoing California drought. Scientists, however, say just the opposite. “[F]or the California drought, which was investigated by three teams from the United States, human factors were found not to have influenced the lack of rainfall,”NOAA reported in an accompanying press release. Are in the GREATEST OF CARE?